On Sunday mornings growing up, my parents would load me in the car, and drive out of their way to pick up my Great Aunt Edna on the way to church. Aunt Edna lived in a run-down, grey shingled house even further out in the country than where we lived. As we pulled in her driveway, she would be waiting for us with her walker which could be fit with just the right amount of finagling into the trunk of our car. When I picture her in my memory, it is with her hair just freshly removed from rollers and tied around with a scarf. Her wide, cat-eyed glasses and thin face gave her a distinctive look that remains fixed in my mind. She always had on a polyester dress…perhaps cotton in summer…and a cardigan sweater, with stockings and heavy soled shoes. A large leather purse was hanging on her arm, and she always had her bible with her. She would walk slowly and steadily with her walker from house to car, then car to church. Although I am sure we must have sat together during the service, I remember mostly the car ride home. This is probably because Aunt Edna always had a little snack for me hidden in her purse…an apple, or a cookie, or even a little three musketeers bar from time to time. We were never out of church until early afternoon, so her snacks seemed like both sustenance and reward. I was taught never to ask for nor to expect them. But at some point during that ride back to her house, Aunt Edna would invariably open her purse and produce something for me. I always said thank you, for whatever it was, and I always meant it. Visiting Aunt Edna was an austere experience. She was widowed, and shared the old house with her son. Don was a person with a developmental disability who had lived in that house all his life and would continue to do so until he was alone, when he would be taken to a group home for the remainder of his days. We rarely saw him, as he was shy and reclusive. Like a scene playing out between Scout and Boo Radley, I always kept an eye out for Don and hoped to see him, but then quickly went back to minding my own business when I did catch a glimpse, knowing he was even more scared by me than I was of him. Their house had old wall paper, and smelled of moth balls. Blankets blocked off the upstairs so that only the lower level needed to be heated. There was one scratchy brown couch my mom and I sat on; my dad sat in a wooden arm chair. There was an old horsehair love seat in the corner that no one ever sat on, nor did anyone ever want to. Aunt Edna always sat in her recliner, with a basket of yarn at her feet and a bible by her side. Often, the house had the lingering aroma of fried onions and potatoes. The dining room wasn’t used any more, but on it, Aunt Edna had displayed the many letters and occasional gifts she received from missionaries and other traveling ministers whom she had befriended during their visits. She wrote to them, and she prayed for them. And she prayed for our pastor, and for her family, and for the people she knew, and those who she didn’t know but realized needed to be prayed for. She would always say a prayer for my family and I before we left each week. She prayed for everyone. I like to think she prayed for everyone, regardless. I was very young during most of these visits, and I thought of my Aunt Edna as a frail, quiet, and kind woman. So, it came as a surprise to me when I heard her referred to as a “Prayer Warrior” one day. I can’t recall who coined that term in reference to her, but it was said with reverence, and maybe even just a hint of respectful fear. I always looked at her a little differently after I heard that, wondering exactly what she had done to earn such a title. When she got sick, I added her to the people I prayed for at bedtime, too. When she died, I closed my eyes and saw a clear picture of her praying, surrounded by radiant stars and the images of all the people she held in prayer. I was too young to second guess myself when I had visions like that, and that image brought me comfort and peace. It told me something about who she really was, beyond the glasses and the sweaters and the snacks. I have come to believe that it gave me a little glimpse of her, this humble saint, as she was seen and known by God. 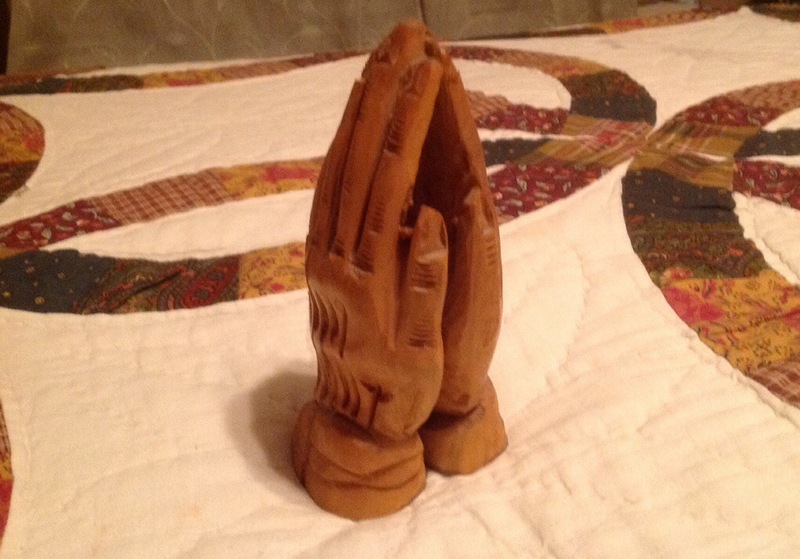 After her funeral, one of her children gave me set of wooden, carved praying hands that were among the treasures she kept on her dining room table. I have kept those hands with me through all my journeys…geographic as well as spiritual. I cannot imagine a more lovely tribute to carry with me of this woman who was a quietly powerful influence on my early life. I was thinking of Aunt Edna today as I was preparing the last entry of our Who is My Neighbor series at St. Thomas, and I read the words from this week’s Gospel lesson: “…all who exalt themselves will be humbled, but all who humble themselves will be exalted.” What a powerful lesson that is. I honestly cannot imagine a more humble person than Aunt Edna. My childhood vision of her, a saint amid the stars, is far more powerful than picturing her with money or mansions, or with fame and renown. In quiet ways, she upheld and shaped so many. She taught me how to give quietly, to love openly, and to pray wholeheartedly. There are a few truths I hold now that are quite different from the beliefs I was taught as a child. I was taught that death severed our connections with the departed; we didn’t pray for the dead, and the dead did not intercede for us. I don’t adhere to that line of thinking. In fact, I sometimes imagine my humble, saintly great Aunt Edna still holding me in prayer, nurturing a glimpse of something in me even as a small child who sat on her knee as she sang and prayed. She nurtured me humbly through a kind of divine openness. Maybe it was that she was a more distant relative, but I never recall her telling me…or anyone for that matter…what to do, or what to believe. She simply prayed, holding confident in that one thing she could do, and leaving the rest in the hands of the divine. I am grateful today for this humble saint and spiritual guide, with snacks in her purse and God in her heart. Sometimes that is everything we need. This entry was posted in Who is My Neighbor? and tagged aging, childhood, Christianity, disability, memoire, memory, prayer, praying, relatives, religion, spiritual guides, spirituality, visions. Bookmark the permalink. What a beautiful tribute and so well written, as always. Your words paint pictures in my mind and I could visualize your sweet Aunt Edna. “She simply prayed, holding confident in that one thing she could do, and leaving the rest in the hands of the divine.” This line really sums up my feelings about modeling spirituality rather than forcing it. Thanks for sharing such a personal story. It was wonderful. Thank you so very much for reading, and for your kind note. It was lovely to climb back inside these memories and think about the lessons I learned at a young age. Its a joy to write them down!